Camera filters provide a range of optical filtering effects for various scientific, research, and industrial cameras. Many styles are used for color balancing, matching CCD or other sensor sensitivity ranges, emphasizing or blocking ranges of spectra such as ultraviolet, infrared, or portions of the visible spectrum (colors). Ultraviolet clear- Ultraviolet pass camera filters are general service filters that block ultraviolet light, which can cause a hazy look, and serve to protect more expensive lenses. Visible pass- Visible pass filters allow visible light to pass while blocking both infrared and ultraviolet. Visible block- Visible block camera filters, by contrast, allow the infrared and ultraviolet ranges of the spectrum to pass, while blocking the visible. Infrared pass- Infrared pass camera filters allow only light in the infrared range to pass. Infrared block- Infrared block filters are used to prevent the infrared portion of the spectrum from passing. This is particularly important when dealing with CCDs and other sensors, which may be sensitive to this range of light. Linear polarizer- Linear polarizer filters allow a preferred orientation of light; frequently used to block glare, especially from metal objects. 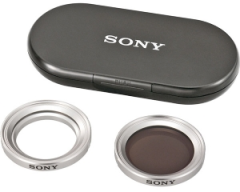 Circular polarizer- Circular polarizers reduce or eliminate glare from non-metallic sources such as glass or water. Neutral density- Neutral density filters reduce the light-dark contrast and are used to bring images within the acceptable luminance range for CCDs and other image sensors; this can effectively increase resolution. Sky filers- Sky filters are designed for outdoor use to filter sky haze and effects from non-visible components of the spectrum. Color correction-Color correction camera filters emphasize or limit the influence of specific colors. Cooling- Cooling is a photographic technique that emphasizes cooler colors such as blue. Some camera filters come in a wide range of shades and light blocking degrees. Only general color characteristics are listed here for filters for which color is a primary specification. Color choices include clear, red, orange, yellow, green, and blue. Important filter dimensions to consider when searching for camera filters include filter shape and filter size or diameter. Shape- Filters are either round or square. Filter size- Filter sizes and diameters range from 27 mm to 122 mm with many variations in between. Important specialty or effects to consider when searching for camera filters include graduated, center spot, diffusion filter, star filter, and prism. 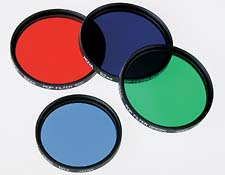 A graduated filter has variation or graduations of color or ND properties across its diameter. A center spot emphasizes the center of the field of view. A diffusion filter diffuses light for an image softening effect. A star filter creates a "star" effect of points coming off images. Some filters contain prisms or facets that create multiple images of a single subject - many patterns are available.